Renal lymphangiectasia is a very rare benign disorder characterised by dilatation of the perirenal and peripelvic lymphatics. The condition is commonly misdiagnosed for other cystic lesions of the kidney such as polycystic kidneys. The diagnosis can be made with near-certainty if classical imaging findings are recognised. We report a case of bilateral renal lymphangiectasia, diagnosed on ultrasonography and computed tomography based on the typical imaging findings and the laboratory analysis of aspirated fluid. The patient was managed conservatively. Renal lymphangiectasia is a rare benign disorder of the kidneys with dilated perirenal lymphatics caused by non-communication of the perirenal and peripelvic lymphatics with the main lymphatics.1 The condition in itself is benign, but is commonly misdiagnosed as other cystic renal diseases and hydronephrosis.2 Knowledge of this condition and its typical imaging appearances will assist radiologists to arrive at the correct diagnosis and permit appropriate management of the patient. 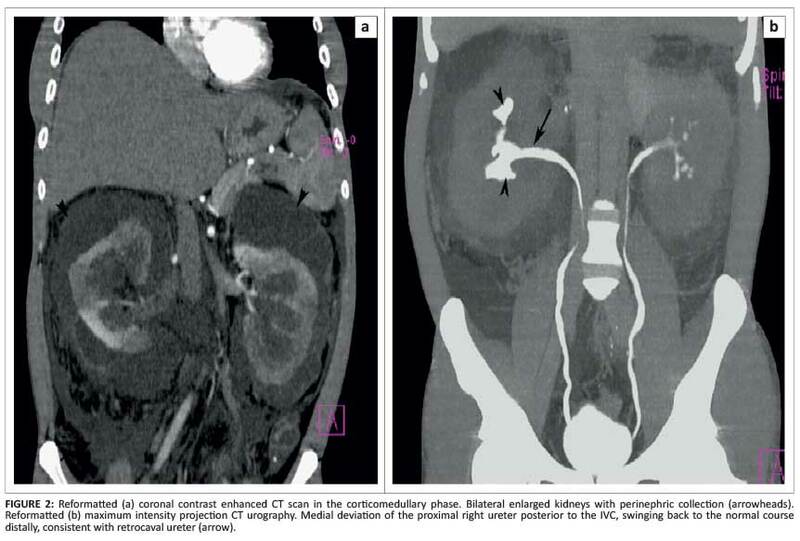 We present a case of bilateral renal lymphangiectasia associated with a right-sided retrocaval ureter with typical ultrasonography (US) and computed tomography (CT) findings. To the best of our knowledge, this is the first reported association of bilateral renal lymphangiectasia with a retrocaval ureter. Ethical clearance was obtained from the institutional review board. A 24-year-old male presented with complaints of abdominal pain and distension, which he had experienced for two years. He had an episode of haematuria one week prior to presentation. He had no history of fever, diabetes mellitus or any previous abdominal surgeries. On clinical examination he was hypertensive with a blood pressure of 150/110 mmHg and had abdominal ascites. Routine laboratory investigations revealed his haemoglobin, total leucocyte count and differential leucocyte counts to be within normal limits. His blood urea nitrogen level was 7.14 mmol/L (normal range: 8.0-16.4 mmol/L), serum creatinine 79.56 µmol/L (normal range: 50-110 µmol/L) and blood urea nitrogen to creatinine ratio 22.2 (normal value: < 10:1), indicating prerenal azotaemia. His urine examination was normal. The patient subsequently underwent imaging to assess the abdominal pain and distention. Ultrasonography examination of the abdomen using a 2-5 MHz curvilinear transducer (Philips iU-22, Eindhoven, Netherlands) demonstrated bilaterally enlarged and echogenic kidneys with loss of corticomedullary differentiation. There were large, clear, multi-septated fluid collections in the perinephric spaces bilaterally, which were indenting the surface of the kidney, and mild hydronephrosis on the right side (Figure 1). There was mild to moderate ascites. No cysts or masses were identified in other organs. A contrast enhanced CT of the abdomen was performed on a six-slice helical scanner (Siemens Somatom Emotion 6, Munich, Germany) to investigate the extent and relation of the fluid collection to adjacent structures. 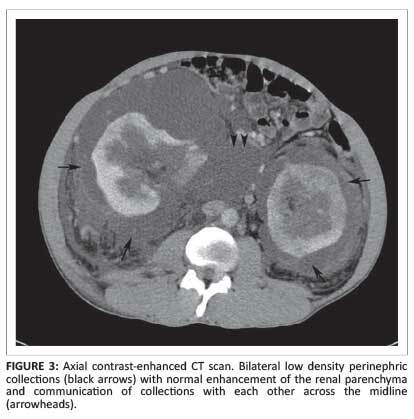 This revealed enlarged kidneys with preserved reniform shape as well as septated perinephric collections (Figure 2). The two fluid collections were communicating with each other across the midline, anterior to the inferior vena cava and aorta (Figure 3). The density of the fluid collection ranged from 3-10 Hounsfield units. No soft tissue or fat density masses were present within the fluid collections. Both ureters were delineated throughout their course and a retrocaval ureter was noted on the right side coursing medially, posterior to the inferior vena cava at the level of the renal hilum and coursing back laterally (distally). On the right side, there was hydronephrosis and blunting of the calyces secondary to the retrocaval ureter (Figure 2). There was no hydronephrosis on the left side. Renal arteries and veins were normal on both sides. Both kidneys showed normal contrast enhancement and excretion. The perirenal fluid, aspirated under ultrasound guidance, was found to be clear and straw coloured. Laboratory analysis of the aspirated fluid revealed urea level of 5.24 mmol/L, total protein of 0.77 g/dL, absence of triglycerides and the presence of a few lymphocytes. On protein electrophoresis there was a selective protein band in the albumin region. Both gram and acid-fast stain revealed no organisms and culture was negative. The laboratory analysis was in favour of lymphatic fluid. The diagnosis, based on the typical imaging findings and the laboratory analysis of the fluid, was bilateral renal lymphangiectasia with a retrocaval right ureter. Following conservative management with antihypertensives and diuretics, his renal function improved and blood pressure returned to normal. The clinical course of this condition is variable. Most commonly, is asymptomatic and is diagnosed incidentally. However, there can be sudden appearance and rapid growth or cessation of growth and even spontaneous regression of symptoms.5 When symptomatic, abdominal pain, haematuria, hypertension and renal failure are usually the presenting features.4 Exacerbation during pregnancy has also been reported.1 In this case report the patient presented with abdominal pain and distention with hypertension and features of prerenal azotaemia. Our case is of interest as renal lymphangiectasia is a rare benign condition which imaging can differentiate from other cystic diseases of the kidneys and perinephric space. To the best of our knowledge, an association of this condition with retrocaval ureter has not yet been mentioned in the literature. Knowledge of this condition will be helpful in the work-up of cystic diseases of the kidney and in arriving at the correct diagnosis. The diagnosis can be made with near-certainty if typical imaging findings as described here are recognised on US and CT. In difficult cases, an imaging-guided fluid aspiration and laboratory analysis can help to establish the diagnosis and avoid unnecessary surgical procedures and their associated risks. Most patients can be managed conservatively and their cases have an uneventful course once the diagnosis is correctly established. The authors would like to thank Mrs Ranjana for her assistance in English language and grammar in writing the manuscript. G.S. (Bangalore Medical College and Research Institute, India) performed the imaging. S.N.S. (Bangalore Medical College and Research Institute, India) and H.S. (Bangalore Medical College and Research Institute, India) interpreted the imaging studies and wrote the manuscript.